Banglalink 21Tk Recharge Offer! 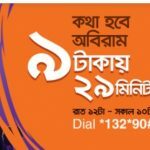 Bangladeshi one of the most Telecom operator Banglalink has come for their valuable customers to Banglalink Tk 21 Recharge Offer.Majority of the peoples in here who are using Banglalink. But they could not know about Banglalink any offer.If you want to know about this offer, just read this full article to get a clear concept. Now only tk 21 recharge and customers can enjoy 1.05p/Sec call rate to any operators for 24 hours in BD. To get 1.5p/Sec call rate (63 paisha) to any numbers jut recharge tk 21. All banglalink prepaid customers can enjoy this offer. Customers can use this special call rate offer in 24 hours. Validity this call rate offer in 7 days. After recharge tk21, customers also get 21% bonus to buy any Banglalink Internet Package. Customers also can get 1 second pulse. To know more details about this offer, customers need to dial 121552. We hope all prepaid customers will get about Banglalink Tk21 Recharge Offer details. Have you any confused about this offer, just comments the box. We will try best to solve your problem. Thanks all Banglalink customers to stay with us.